18ct yellow gold is made by mixing 75% pure gold (750 parts per thousand) with 25% (250 parts per thousand) other metals such as copper, zinc and silver. Metal of 9ct yellow is 37.5% (375 parts per thousand) pure gold, with a higher proportion of these other ingredients. Metal of 14ct is 58.5% pure gold (585 parts per thousand). The higher the component of pure gold, the more yellow the colour. The yellow gold alloys we use do not contain Nickel, which can be a cause of allergy in some people. In practical terms, 18ct generally holds up to everyday wear better than 9ct and tends to look better than 9ct as it ages over the years. This is one of the reasons why 18ct is normally preferred for ladies engagement rings rather than 9ct. The hardness is virtually the same. 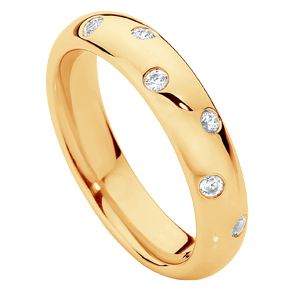 It is a common misconception that 9ct gold is harder than 18ct, in reality they are very similar. Metal of 14ct is not very commonly used.